Nutritech Hydro Whey is made with Hydrolyzed Whey for faster absorption and naturally sweetened with Stevia. If you want to increase muscle you need to consume protein. Athletes get their protein mainly from meat and eggs. To supplement their protein intake they will drink a protein shake, especially after their workouts for recovery. The Whey used in this product makes it a premium recovery drink due to how quickly Hydrolyzed Whey is absorbed. It is one of the fastest whey sources available, making it a smart choice for athletes who want to optimise every aspect of their muscle building potential. What makes Hydrolyzed Whey so fast is that the process of hydrolyses is used to break down larger whey molecules to their core, bypassing the physical process of making them smaller. Each serving provides 5.3 grams of BCAA’s which have been well researched for their muscle building capabilities. Fitness athletes who avoid artificial colourants and sweeteners will appreciate that this shake has been naturally sweetened with Stevia. 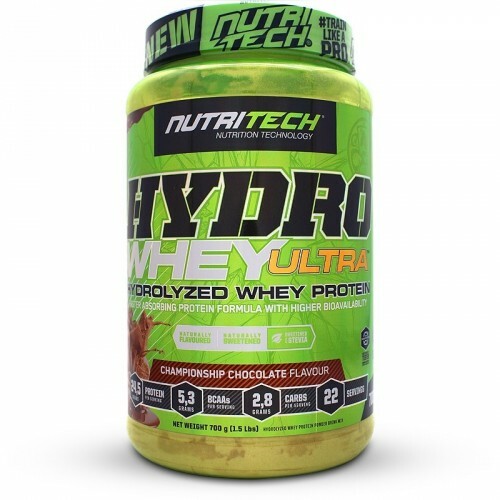 Nutritech Hydro Whey is one of the best quality shakes currently on the market. Created for fitness enthusiasts and athletes who demand nothing but the highest quality from their protein supplement for the fastest gains possible. Manufactured in a facility that uses eggs, dairy, soy, wheat [gluten] and nuts. • Mix 2 level scoops (approx 31.8 grams) with 200 ml of water in a shaker. • Drink within 30 minutes of finishing your workout. • Take 1 – 3 servings per day, or as required to satisfy your daily protein needs. This product is not intended to diagnose, treat, cure, or prevent any disease. Consult your doctor prior to using this product especially if you have any suspected or known medical condition. The Vanilla flavor was just not for me. Always leaving clots and not dissolving properly, even resorted to using a blender but still same thing. Best protein around and its naturally sweetened!